With a population of more than 2.4 million, Miami-Dade County is the most populous county in Florida and among the top 20 most populous metropolitan areas in the United States. By the year 2035, the region’s population is expected to climb to approximately 3.2 million, while the number of households grows 40.7 percent, from the current 0.83 million to 1.2 million. In addition, the number of jobs in the county will increase from 1.3 million to over 1.9 million. Miami-Dade County is almost 2,300 square miles in area and encompasses thirty-one municipalities and the unincorporated area. The City of Miami is the County’s most populous municipality, with a population of more than 415,000 inhabitants. There are 6 municipalities with populations over 50,000 and they are the City of Hialeah, City of Homestead. City of Miami, City of Miami Beach, City of Miami Gardens, and City of North Miami. 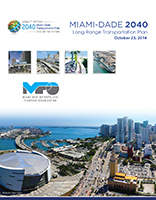 The update of the Miami-Dade County Long Range Transportation Plan to the Year 2040 is a primary activity in Miami-Dade County’s transportation planning process to meet federal and state requirements for an update of the Transportation Plan every five years. Federal law requires that the LRTP address minimum of a 20-year planning horizon from the date of the MPO adoption. The last LRTP update, the 2035 LRTP, was approved by the Metropolitan Planning Organization (MPO) Governing Board in October 2009. The 2040 plan update includes in-depth consideration of intermodal improvement opportunities, freight movement, Intelligent Transportation System technologies, and Congestion Management. A major emphasis of the 2040 LRTP is the inclusion of projects that improve the operation of the existing system. This emphasis on increasing the efficiency of the current infrastructure, in light of soaring construction costs, is embodied in the Congestion Management Process, adopted concurrently and incorporated into the LRTP. Congestion management includes the implementation of strategies designed to reduce vehicle trips; shift trips from single-occupancy vehicles to high-occupancy vehicles; and maximize the effectiveness and efficiency of the existing transportation system. Other emphases of this plan update involve the utilization of quantitative metrics to measure the effectiveness of the plan in terms of its impact on mobility, safety, sustainability, and operational considerations; the consideration of non-motorized modes of transportation; and freight transportation improvements. The inclusion of non-motorized improvements in the plan promote quality of life issues for the County’s residents and visitors and include sidewalk improvements, and pedestrian and bicycle trail improvements. The plan’s dedicated section for freight transportation improvements is a critical component of the plan, providing for improvements to the County’s economic engine to support the economic growth and prosperity of the County.